Healing from grief doesn’t have to be slow or painful. This workshop will show you how to help clients navigate the journey of grief more easily and view loss as a pathway to greater compassion, deeper relationships, and more meaningful living. Healing from grief doesn’t have to be slow or painful. This workshop will show you how to help clients navigate the journey of grief more easily and view loss as a pathway to greater compassion, deeper relationships, and more meaningful living. 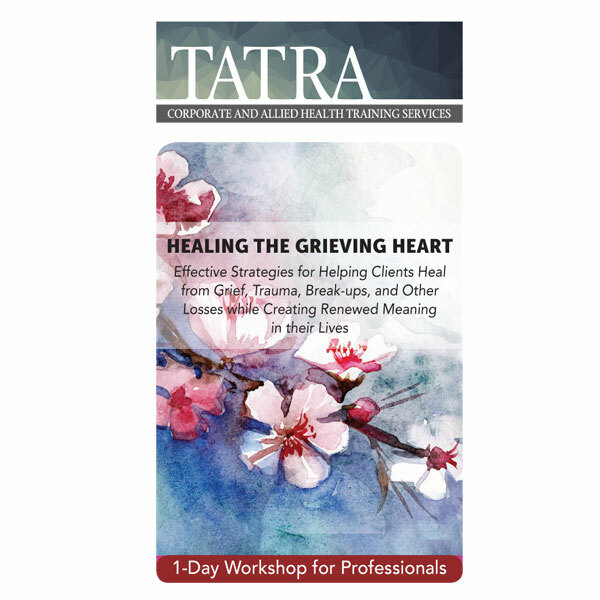 You will discover why the face of grief and loss has changed over the last decade and acquire a host of contemporary strategies you can use to comfort grieving clients and help them move forward in positive, healthy ways after loss. You’ll learn about scientific breakthroughs that have led to better treatments for grief and loss as well as practical, creative applications of these discoveries. For example you’ll learn how to accelerate healing using creative tools such as imagery, ritual, music, and mindfulness and engage positive systems in the emotional brain. You’ll also learn how to incorporate your client’s unique cultural and spiritual values and discover surprising techniques for resolving complicated grief and difficult emotions such as guilt, resentment, and despair. Last you’ll learn methods for assisting children through loss and how to help clients successfully navigate ambiguous losses such as breakups, divorce, infertility, miscarriage, job loss, and the declining health of aging parents.